Welcome to NELCO ELECTRIC Inc, serving the Milwaukee area and Southeastern Wisconsin since 2003. Nelco Electric is a Wisconsin based electrical contractor that has had the privilege of providing services to many distinguished general contractors and industrial and commercial clients since 2003. Our steady growth and success has been directly attributed to our team of professionals and their many years of education and experience in the electrical industry. Nelco Electric has built a reputation on quality, supplying value-added design, delivery of cost-efficient installations, and consistent attention to project schedules. Nelco Electric’s employee base continues to grow. 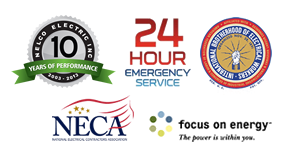 As a signatory member of NECA and IBEW LU 494, we enjoy access to an unlimited source of highly trained, skilled craftsmen. Our clients receive added value from the years of training, knowledge and experience that our electricians bring to each project. As part of our commitment to safety, our field crews participate in quarterly safety training. A strong internal support staff, excellent field supervision, and an up-to-date inventory of equipment and resources give us the ability to complete projects on time and within budget. Contact us today for a consultation or estimate!